Burning planted longleaf, Okra Paradise Farms, Lowndes County, Georgia. Pictures by Gretchen Quarterman, 16 December 2011. The longleaf themselves are the most fire-resistant of trees. Almost all of these longleaf will survive the fire and thrive. 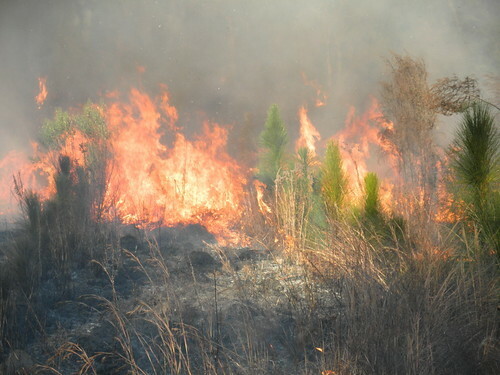 The volunteer loblolly and slash, not so much, and any oaks or other trees even less, so fire favors the longleaf. 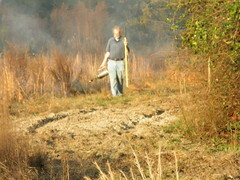 We had perfect burning conditions: 5-8 MPH wind from the northwest, blowing towards the road. Some of the subdivision neighbors who are not familiar with prescribed burns called the county fire department. 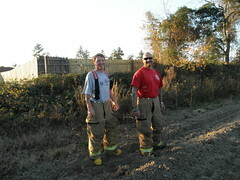 They came out, took one look at the firebreak, and filed a report saying all was OK. Here's a slideshow and a playlist of some videos. Videos by Gretchen Quarterman, 16 December 2011.